palm trees and ocean. sigh. A long weekend that feels like a vacation is a wonderful thing. Seeing loved ones, visiting beautiful places, getting out of the same-old-same old, is exhilarating. Except in my case, it’s leading to brain freeze and procrastination. Even as I was heading for the airport yesterday, I casually remarked to Bruce that I wished I could have just stayed there for a week or so. I kept my writing schedule while I was away. But this morning, I could not write. It’s taken me approximately 6 hours to warm up to something that resembles worthwhile writing. Luckily, I had several conference calls to wake me out of my stupor and force my protesting brain to function. Maybe it was the Southern California weather. It so foreign to me now, but there was a time in my life that I took it for granted. Sunny and gorgeous with towering palm trees swaying ever so slightly in the breeze was just how every day went when I was 12. The twins are lucky to grow up in such a pretty place especially since their parents are outdoorsy. They’ll take full advantage of being able to do all kinds of sports—and see snow and ocean on the same day. Or maybe it was the flight back. There was something vaguely vacation-y about it. So many people snoozing, listening to music, or working in their ever-so compact spot. They all seemed so carefree. Oh wait, they’re probably Californians, or at least others who have adopted a Californian’s attitude, despite being from somewhere else. Unlike my recent flights to such exotic East Coast destinations as Philadelphia, LaGuardia, and Raleigh-Durham, there was no pushing. There was no line-jumping. There didn’t seem to be much stealing of extra overhead bin space. No chewing out of the flight attendants or gate staff. No exasperated looks. No snide comments. Everyone seemed pretty chilled out and ok that they were going to spend three hours doing whatever until we arrived in Dallas. Perhaps that’s what I am longing for today. A bit of bliss. Calm serenity. Maybe that’s what my brain is fighting for. 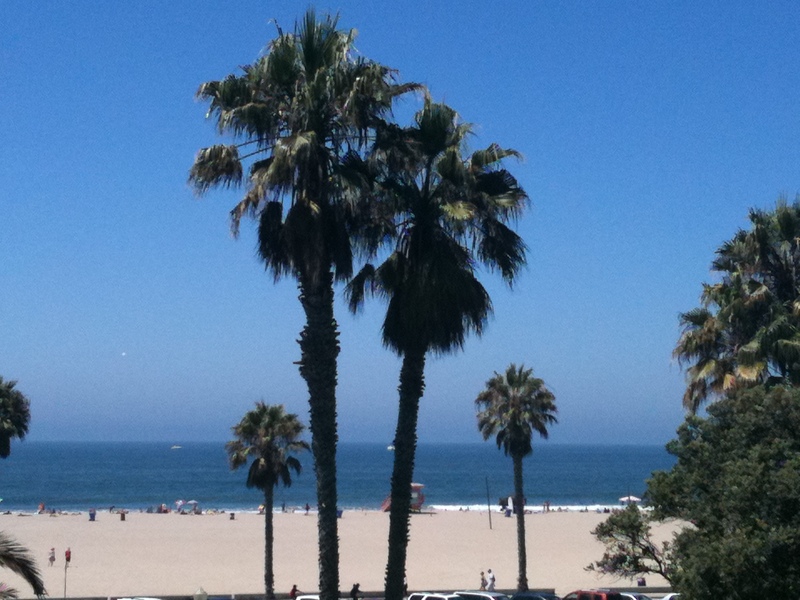 Or maybe just a view of the ocean and a palm tree or two. Methinks it’s a good day to organize my photos. 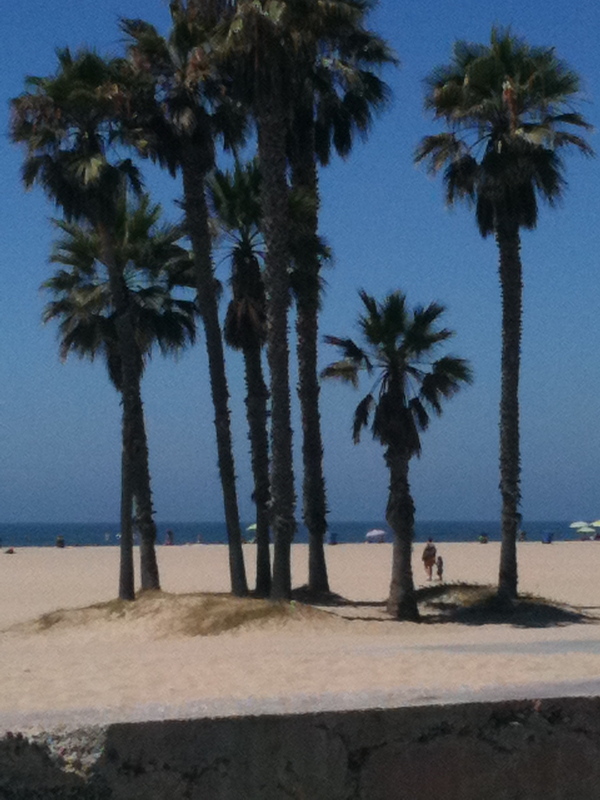 This entry was posted in So and tagged attitude, bliss, California, Julie Petroski, ocean, palm trees, serenity, travel. Bookmark the permalink. How exotic, while I took a constitutional to the beach one hour and forty minutes to blow the cobwebs away and return to put my scrambled thoughts down for all and sundry to mull over – thoroughly enjoy your posts. Sigh. I’d think something wass wrong with you if you weren’t longing for more time there .